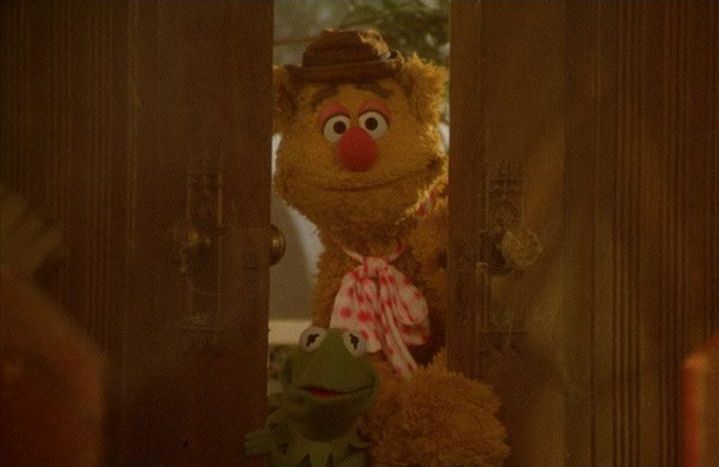 In celebration of Kermit the Frog's 50th Anniversary, Kermit and the rest of the Muppet gang are back on DVD for the release of four anticipated Muppet feature length films: The Muppet Movie, The Muppet Caper, The Muppet Christmas Carol, and Muppet Treasure Island. 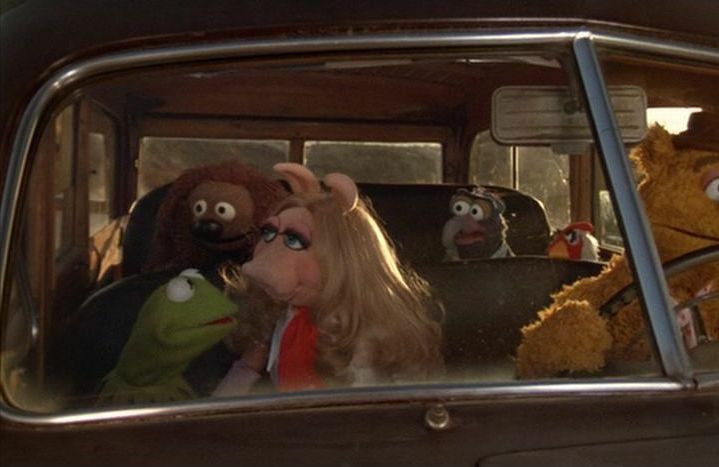 I hadn't watched the Muppets in years, not since the TV show back when I was a kid, so I was pleasantly surprised when I watched these four films and learned that the Muppets charm does transcend childhood! 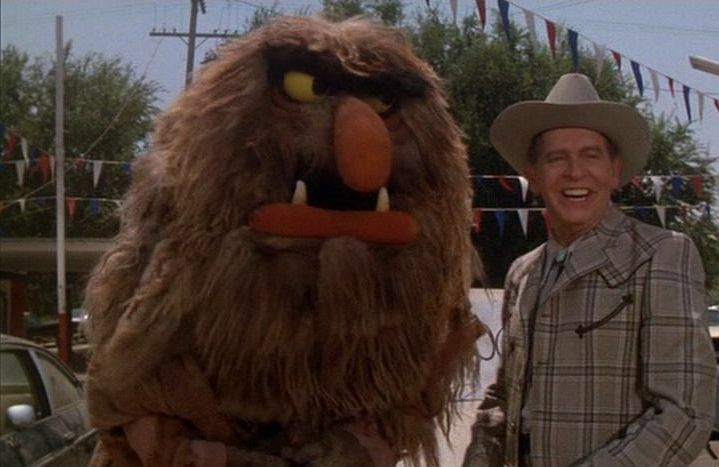 Unlike other shows that I enjoyed as a child only to discover later that they really sucked, these wacky Muppets constantly kept me entertained and laughing out loud. 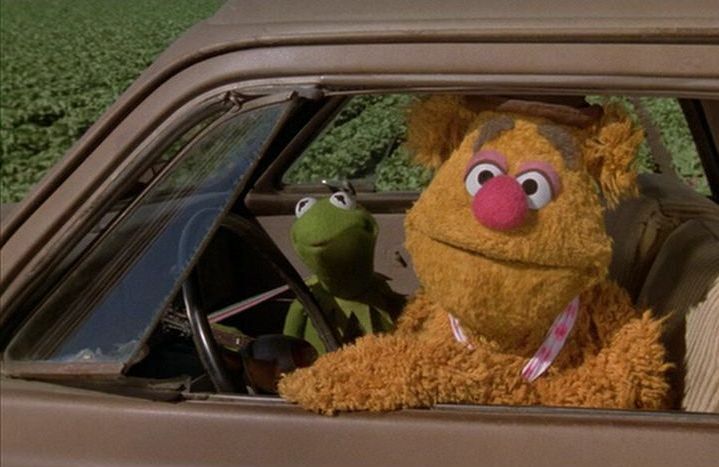 Let's start with the first of the Muppet movies, the one originally released in 1979 and simply titled "The Muppet Movie". 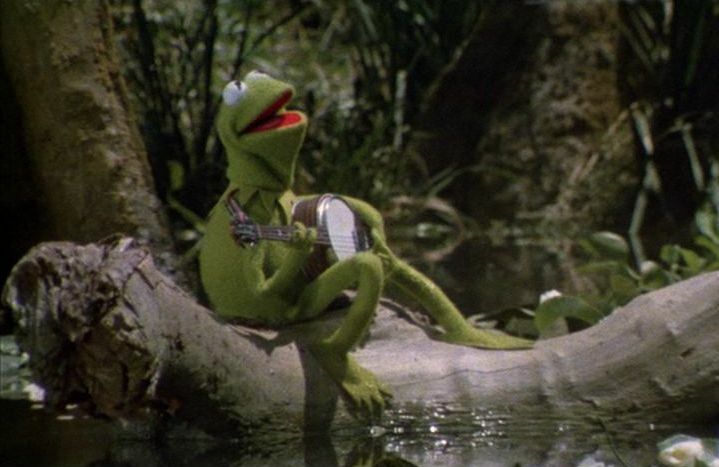 This film more-or-less tells the origin story of the entire Muppet gang, as we start with Kermit the Frog sitting alone in his swamp playing his banjo and end with him and all his new Muppet friends together in Hollywood. 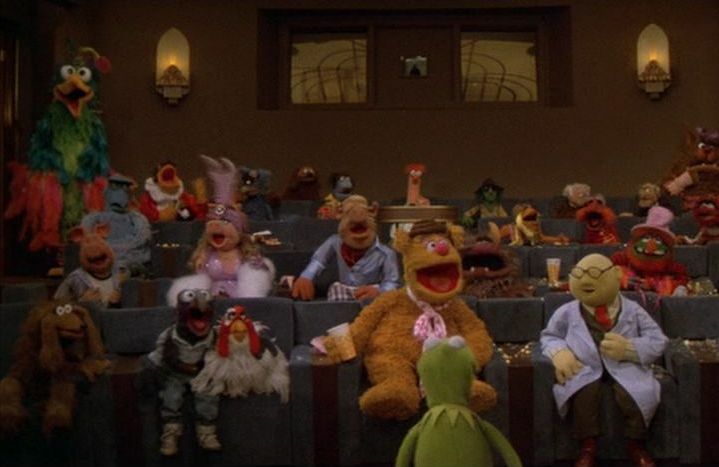 Wait, no, actually it really starts out with all the Muppets sitting down to watch a screening of The Muppet Movie... the movie we're watching now, the one that starts out with Kermit playing his banjo in a swamp. Confusing? Only if you think about it. Funny? Absolutely! 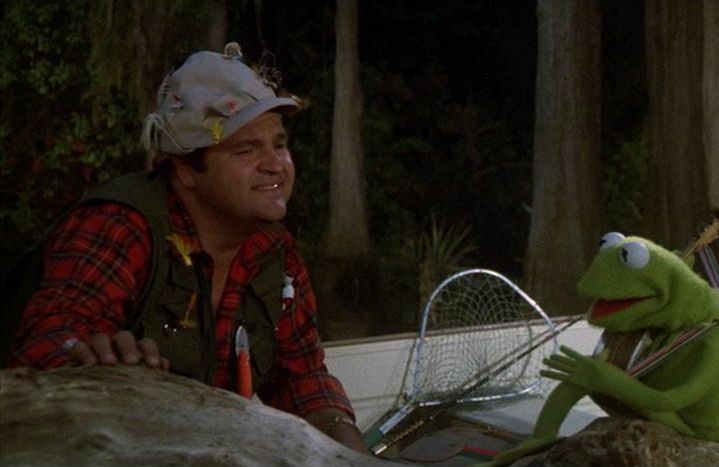 So our beloved Kermit the Frog's journey starts out innocently enough when a big-shot agent (played by the always funny Dom DeLuise) happens to be passing through Kermit's swamp. 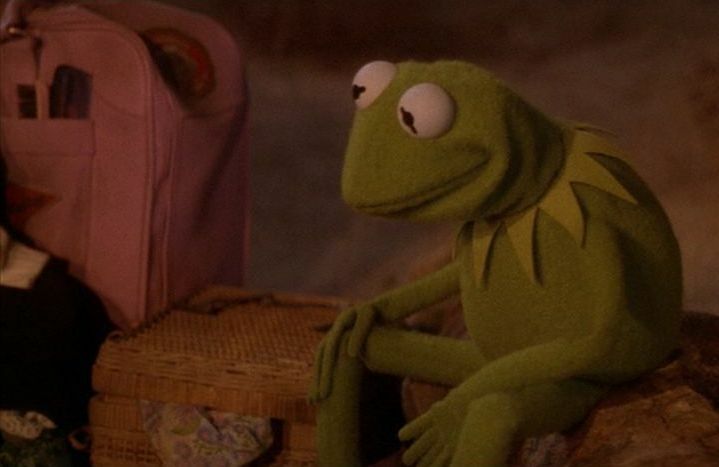 He spies Kermit playing his banjo, and after a little conversation between the two of them, he convinces Kermit that leaving the swamp and heading to Hollywood would be a good move for the little frog. 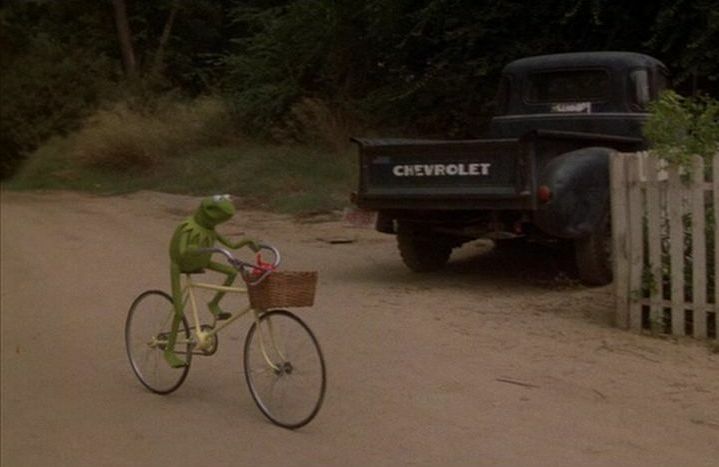 Kermit is assured that he has the talent and the wit to become a big star and make millions of people happy, so after a little pondering, the frog heads off to his destiny. 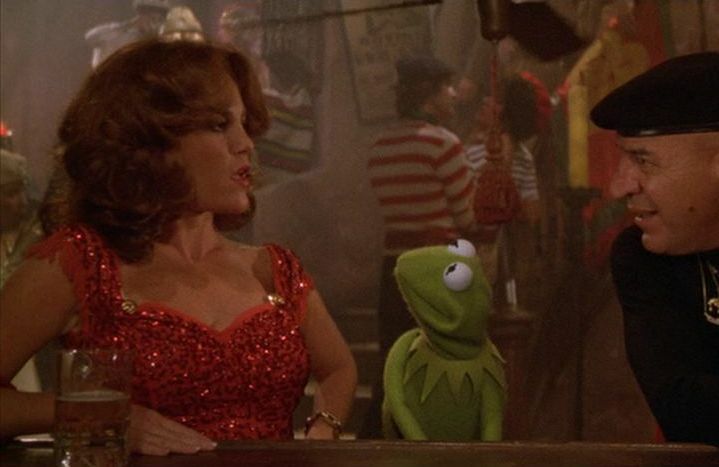 It's not long after Kermit starts his trip that he finds himself in a seedy bar, where he meets his first pal on this journey... the lovable Fuzzy Bear! Fuzzy Bear also dreams of being famous, and so the two-some decides to team up and make the trek together. 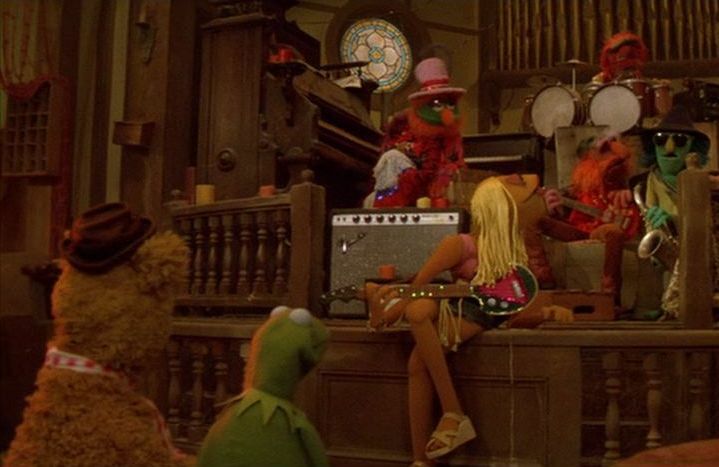 Kermit and Fuzzy's next stop is at an old run-down church, where they encounter the Muppet band, Electric Mayhem, who are in the process of converting the old church into a coffee house where they can play their music. Fuzzy begins to tell them the story thus far, but as Kermit points out, that would take too long... so instead Kermit gives the band a copy of The Muppet Movie script so that they can get caught up! 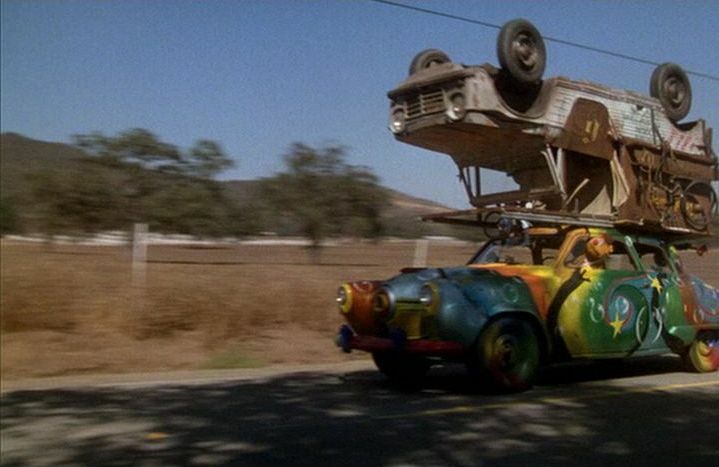 Song ensues, a car gets painted, and before long Kermit and Fuzzy are on the road again... and heading straight for an old beaten-up worn-down truck that's traveling on the wrong side of the road! But just as the two vehicles are about to hit, there's no crash! Turns out, the truck flipped over and landed on top of Fuzzy's car! 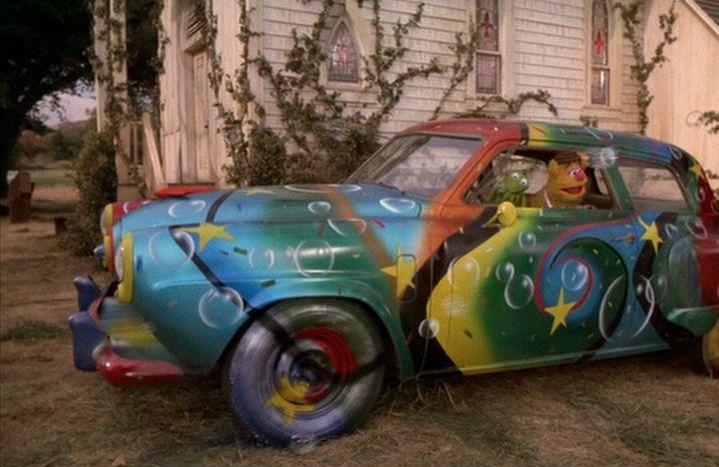 And that's the story of how they met Gonzo the weirdo! Man, this movie is funny, and at this point in the film there's still over an hour left to go! Kermit still has many more pals to meet. 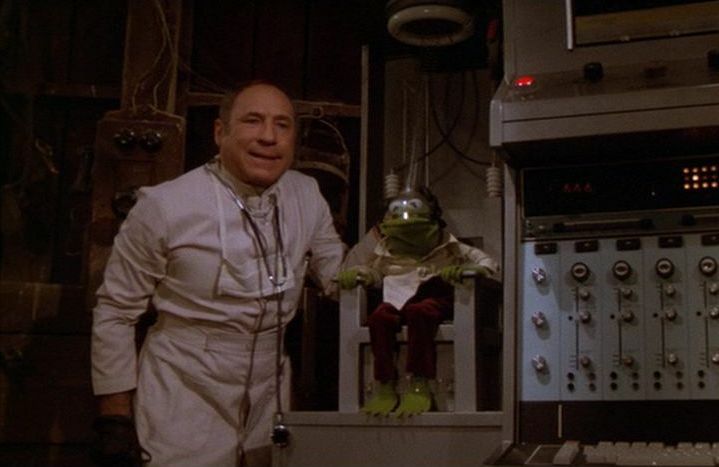 He also must keep avoiding Doc Hopper and his increasingly evil and dastardly schemes to bring Kermit on as his icon. Eventually, the little green guy is gonna have to take a stand against this maniacal madman, so I guess it's a pretty good thing he's made so many friends. But the big question is, when he does finally reach Hollywood, will he become a star. Well, for anyone who's ever heard of The Muppet Show, I guess there really isn't any big question. But that's okay, because there are plenty of big laughs to make up for it. 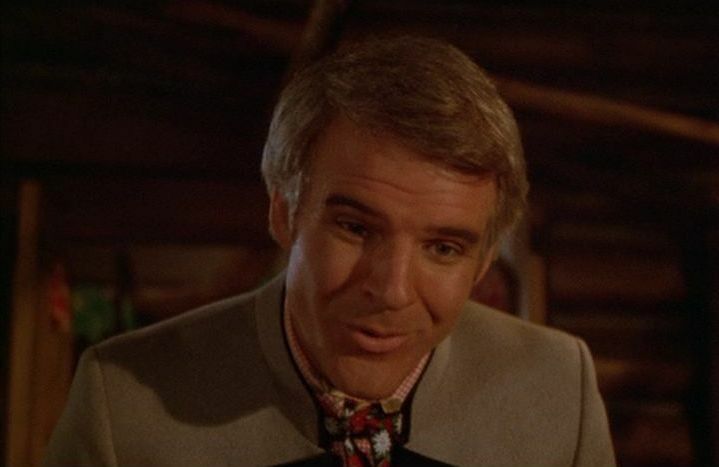 Of course, besides having tons of laughs, this it also has tons of cameo appearances by big name stars, such as Dom DeLuise, Steve Martin, Richard Pryor, Mel Brooks, Bob Hope, Telly Savalas, Orson Welles, Cloris Leachman, and on and on. 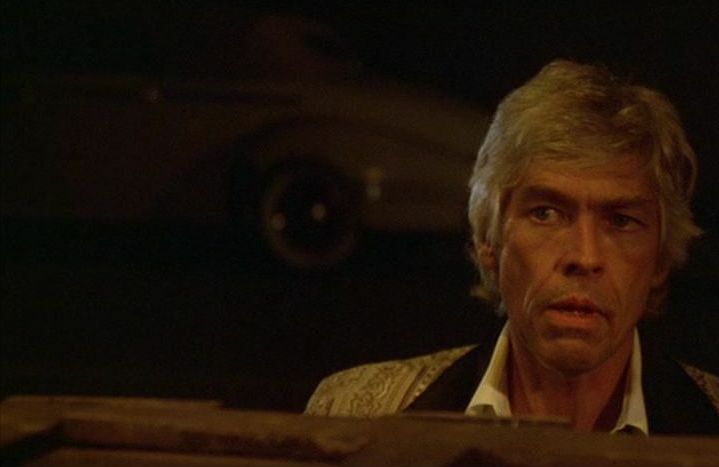 Wow, for a movie made in 1979, it sure was entertaining. Typically, I've noticed that older movies tend to have problems with pacing, probably due to MTV giving us all super-short attentions spans. Thanks a lot MTV. Thankfully, this film only has a few slow moments, and is fun for both kids and adults... sort of like Shrek. I also normally don't like songs sprinkled in throughout my movies, but the songs in here were all pretty good and surprisingly enjoyable. You should definitely check this out if you haven't seen it already. Unfortunately, I accidentally received a duplicate copy of The Muppet Movie instead of this title, so I can't really review it. 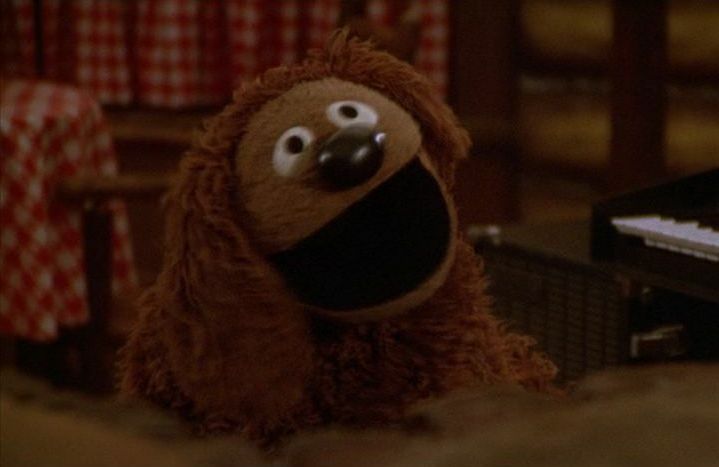 The Muppet Christmas Carol is a Muppet movie version of Charles Dickens's classic tale. 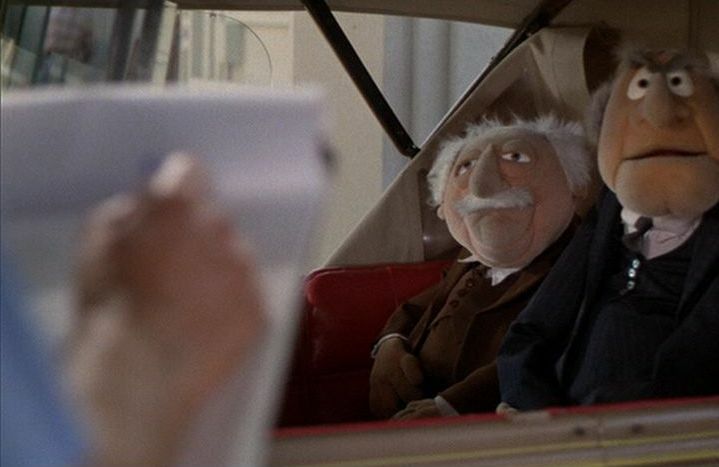 It was beautifully done and wonderful to look at, but it didn't have nearly as many laughs as The Muppet Movie. I suppose that's probably due to the nature of the original material, and also possibly because the main character of Ebenezer Scrooge wasn't played by a muppet, but rather Michael Caine. Don't get me wrong, though, there were still lines that just made me crack up laughing, and Michael Caine played Scrooge very well, so it was still a wonderfully enjoyable film to watch. 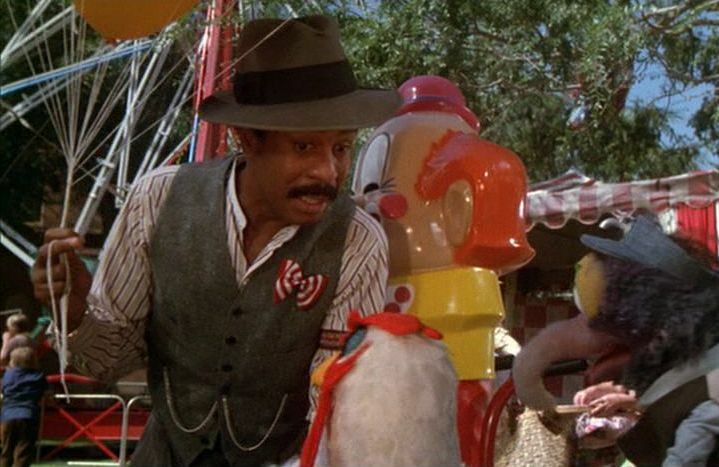 Just don't expect it to be as light hearted as The Muppet Movie. We all know the tale of A Christmas Carol, so do I really need to go over it again? Okay, how about I spend one sentence on plot summary. 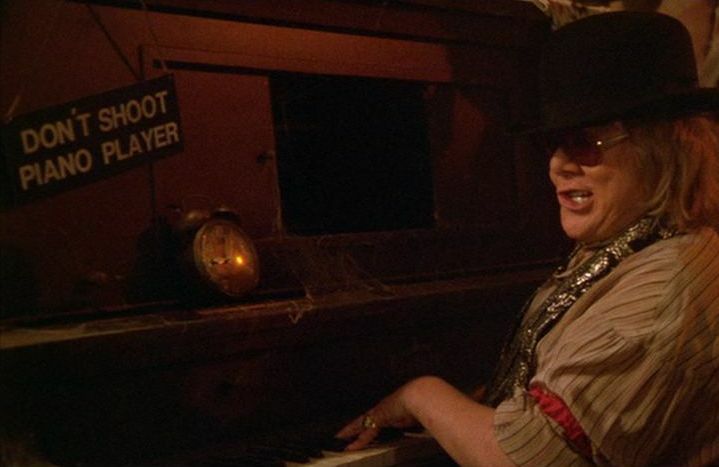 There's this mean old stingy man named Scrooge who is visited in the night by three ghosts who show him scenes past, present, and future Christmas seasons so that he may come to realize the misery he has brought on others and the joy that he is missing out on. Got it? There really isn't much else to tell about this movie. Gonzo plays the part of the story's author, Charles Dickens, and together with his little pal Rizzo the Rat they narrate the story for us. The atmosphere and the scenery are all wonderfully done, and it really feels like a top notch production. As I said, it's not as funny as the first Muppet film, but then A Christmas Carol was never meant to be a comedy. It does bring about the laughs when appropriate, and leaves them out when they would otherwise spoil the mood. Obviously it's a great story, and even I'm sure we're all pretty sick of it by now seeing how almost every TV show tends to do one of these near Christmas, this version still feels like a good one to have available around the house. 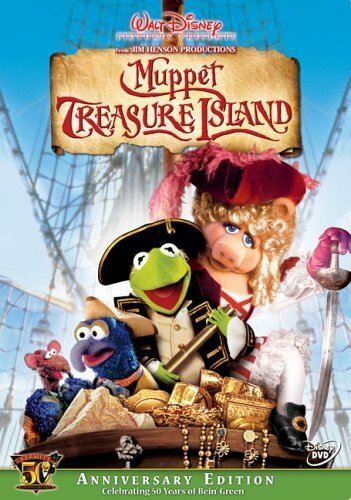 Frankly, I found Muppet Treasure Island to be rather disappointing. 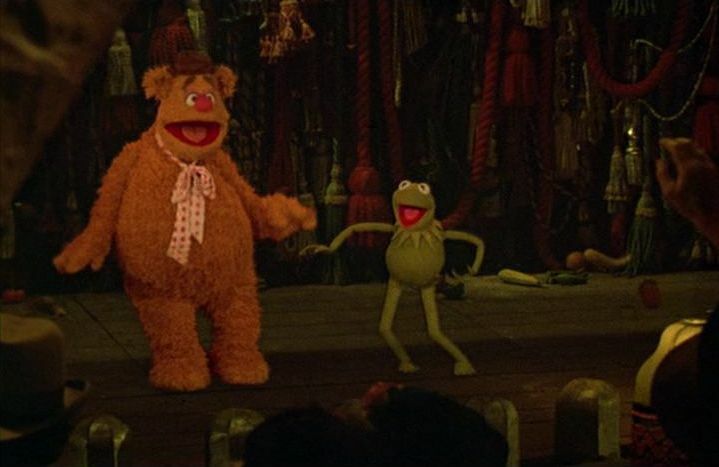 There seemed to be even fewer laughs than The Muppet Christmas Carol, though once again this film is based of a story that was not meant to be a comedy (which is obviously Robert Louis Stevenson's Treasure Island). Yeah, there were still laughs scattered about, but there were also a lot of scenes where I felt no emotion, laughter or otherwise. Also, the production values appeared to be significantly less, as there were many obviously green-screen (or blue-screen) scenes, and this really helped to take me out of the fantasy. The two main characters in this film, Jim Hawkins and Long John Silver, were not played by muppets. They were played by Kevin Bishop and Tim Curry respectively. 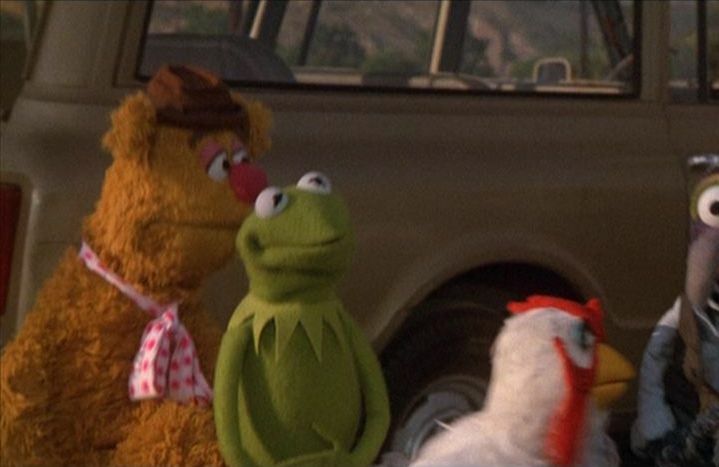 Gonzo and Rizzo the Rat played the part of Jim's buddies, while Kermit the Frog took on the role of the captain, and Sam the Eagle was his first mate. 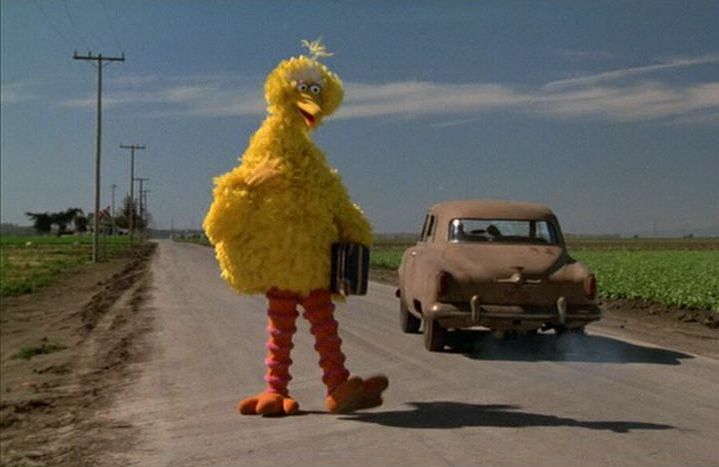 Kermit really didn't bring much of anything to his role here, and I was much more impressed by Sam the Eagle, who really stole a lot of the comedy. The Muppet Band was on board as well, but most of the pirate crew were muppets I never heard of (and who probably didn't exist before this movie). Occasionally funny dialog helped sustain me through the entire film, but overall it just felt flat, with little excitement and not much emotional impact. 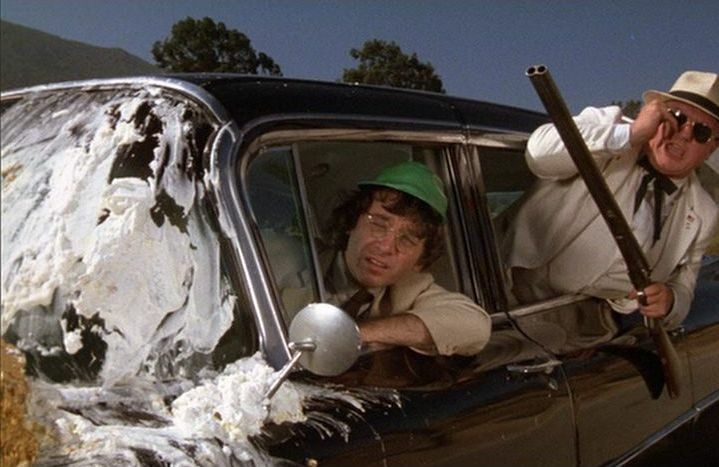 You may want to see it just to experience some of those laughs, such as when Jim and his pals are heading back to the kitchen, and Jim says "I'll wash", Rizzo responds "I'll dry", and Gonzo replies in the absolute perfect tone "I'll break". So yeah, there are some really funny parts in here, it's just to bad there's not many more of them. 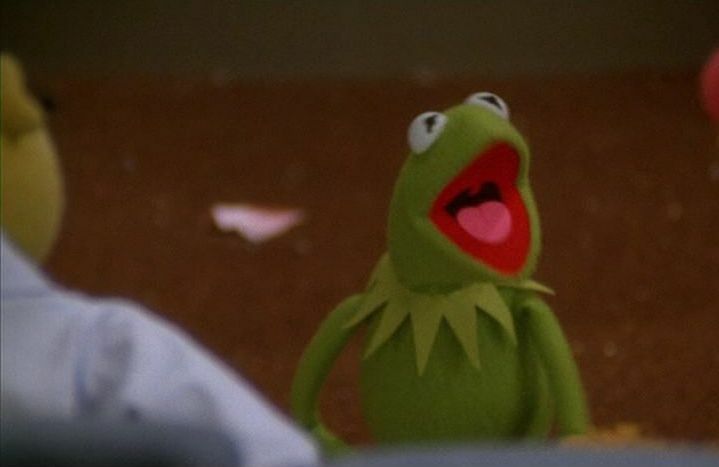 Four Muppet Movies- Kermit's 50th Anniversary Editions was released by Disney on DVD starting November 29, 2005. Visit the official website for more information.